Then there was a single trip that I ended up spending 3 hours of what should have been a leisurely 4 hour layover in customs. We flew in from Mexico to Houston, and managed to get there at the same time as a double-decker airbus arriving from China. Every single person ahead of us had several items to claim, and slowly our window of time to pick up our luggage from claim (you have to re-check luggage flying in from Mexico to board your connecting flight), dash to the other side of the gigantic Houston airport, maybe grab something to eat, and make our connecting flight diminished. My husband had just spent days in the hospital in Mexico and was seriously not feeling well, was weak, and had pneumonia. So I ended up hauling most of our luggage, which totaled to two huge checked suitcases, two regular carry-on bags, and 2 “personal bags” for each of us. It was utterly ridiculous. Part of it was due to our dive gear that we had brought along, but all in all there was no true need for us to bring so much stuff, and in that stressful timeframe I don’t think I have ever resented inanimate objects so much! We have learned and our travel style has changed some from that time, and our most recent experience of spending 2 weeks in Europe, with only a backpack each and a small duffel between us, was so freeing. We had no problems carrying our stuff through train stations and airports, and we didn’t have any checked luggage to have to worry about picking up or getting lost. We saw travelers that had multiple huge bags struggling to find room or lug them from bus stations etc, and I remembered our initial international experience and thanked myself for choosing to pack light. 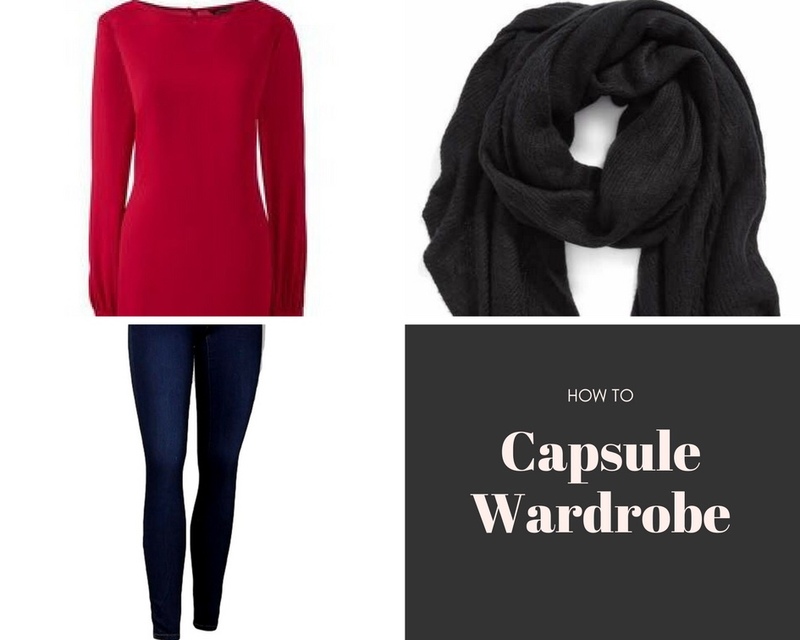 A Capsule wardobe is where nearly every item in your bag can be paired with nearly any other item in your bag to create a maximum number of outfits from a small amount of items. This is ALL the clothes I would bring for a mild-chilly weather 2 week trip. The key to this type of packing is I can layer many of these items depending on the weather, and mix and match to create many different outfits. For example, I can wear the maxi dress with flats on a warmer day, but also throw on the tights and a solid sweater over the top if it gets rainy, while creating an entire new look. I also stick a lot of solids and neutrals for my main pieces, i.e. jackets, bottoms, and at least 1 top, so that the few prints or bright colors and accessories will easily go with any of the basics. Cotton Dress in Rome paired with a tied Chambray button up, and tights. Same dress in Paris paired with a pea coat and scarf. It is all great that you can bring LESS stuff, but sometimes it is still difficult to fit in hand luggage, especially if you are needing some warm items for colder locations. We were recommended these no-vacuum needed seal compression bags by a friend, and they literally doubled the space in my bag! You place your folded clothes inside then roll the bag towards the one-way vent to compress and let all of the air out. It was super easy, effective, and inexpensive. You can buy them and other similar ones here on Amazon. I have read a lot about packing cubes as well, and although I haven’t used those myself, I have heard that it is a great way to organize a suitcase to maximize space. 3. If you aren’t sure if you are going to use it, don’t bring it (This does not include health, safety, and preparedness items). I have found myself reciting the “just in case” argument when in comes to bringing heels, jewelry, hair styling tools, etc. ‘What if I want my hair straight that day instead of curly?’ so I bring my straightener all over the world and don’t even have the time to plug it in. Sound familiar? 😉 I now have switched to bringing little to no jewelry, extra accessories, or electronics. I will wear the same earrings/small necklace, my travel silicone wedding band, and Fitbit watch the whole time. I bring functional accessories like sunhats, sunglasses, gloves, scarves, for example, but not hand-bags, multiple of the same type of shoe, etc. Otherwise a book that will last me the trip, travel journal + guidebook(s), and my phone are really the only entertainment/work related things I will bring. Not only does this eliminate valuables that you have to worry about, but it reduces the amount of random stuff to keep track of and have room for. What tip are you wanting to try to reduce your luggage?